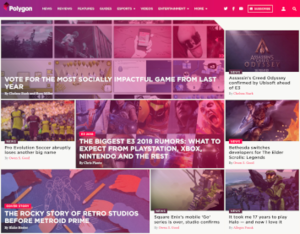 The site was built over the course of ten months, and its 16-person founding staff included the editors-in-chief of the gaming sites Joystiq, Kotaku and The Escapist. Its design was built to HTML5 responsive standards with a pink color scheme, and its advertisements focused on direct sponsorship of specific kinds of content. Vox Media produced a documentary series on the founding of the site. The gaming blog Polygon was launched on October 24, 2012, as Vox Media's third property. The site grew from technology blog The Verge, which was launched a year earlier as an outgrowth of sports blog network SB Nation before Vox Media was formed. Vox Media's chief executive officer, Jim Bankoff, approached Joystiq editor-in-chief Christopher Grant in early 2011 about starting a video game website. [a] Bankoff considered video games to be a logical vertical market for Vox, whose sites attracted an 18- to 49-year-old demographic. He also saw games to be an expanding market in consideration of mobile and social network game categories. Forbes described Bankoff's offer as a "serious commitment to online journalism" in an age of content farms and disappearing print publications, but Grant did not trust the offer and declined. Upon seeing the effort that Vox Media put into The Verge, their Chorus content management system, and the quality of their content and sponsorships, Grant changed his mind and returned to pitch Bankoff. Grant wanted the new site to compete with top gaming websites GameSpot and IGN, but still be able to run longform "magazine-style journalism" that could be of historic interest. [b] As part of the site's attempt to "redefine games journalism", Vox Media made a 13-part documentary series of the site's creation ("Press Reset") that tracked the site's creation from start to launch. Forbes described Polygon's original 16-person staff as "star-studded" for including the editors-in-chief from three competing video game blogs. Grant left Joystiq in January 2012 and brought the editors-in-chief of Kotaku and The Escapist, Brian Crecente and Russ Pitts. Other staff included Joystiq managing editor Justin McElroy as well as weekend editor Griffin McElroy, and staff from UGO, IGN, MTV, VideoGamer.com, and 1UP.com. Ben Kuchera joined the site after The Penny Arcade Report closed in November 2013. The Polygon team works remotely from places including Philadelphia, West Virginia, San Francisco, Sydney, London, and Austin, while Vox Media is headquartered in New York City and Washington, D.C. The site was developed over the course of ten months, where the staff chose the site's name and set standards for their reporting and review score scale. Polygon staff published on The Verge as "Vox Games" beginning in February 2012 and ending with their October launch. The site's name was announced at a PAX East panel in April. It refers to a polygon—"the basic visual building block of video games". After raising money in a second round of funding in late 2013, Vox Media announced that they would be investing further in the site's video product, such that the site's experience would feel "as much like TV programming as magazine publishing". Polygon announced that it would run fewer features in June 2014, with the departure of features editor Russ Pitts, their video director, and video designer. Polygon hired Susana Polo, founder of The Mary Sue, in 2015, which marked a transition in the site's scope to add pop culture and entertainment alongside their video game coverage. GamesIndustry added that the hire marked a changing cultural sensibility in game and tech media towards the acceptance of progressive, feminist principles in the wake of Gamergate. Vox Media later created several sites dedicated to specific video games with editorial staff from Polygon and SB Nation: The Rift Herald for League of Legends esports in March 2016, and The Flying Courier (for Dota 2) and Heroes Never Die (for Overwatch) in June 2017. Brian Crecente left Polygon for Rolling Stone's gaming website Glixel in July 2017, and Chris Plante replaced him as Executive Editor. Polygon video producer Nick Robinson left Polygon in August 2017, following allegations of inappropriate online sexual advances. Video producers Brian David Gilbert and Jenna Stoeber were hired soon after. In 2018, Griffin and Justin McElroy announced their departure from Polygon. We want to focus on the human side of development, and focus things on people. I want people to feel the respect that we feel for them. Polygon publishes video game news, entertainment, reviews, and video. They sought to set their content apart from other games journalism outlets by focusing on the people making and playing the games rather than the games alone. At the site's outset, Polygon planned to run multiple longform feature articles weekly, which they intended to be comparable in intent to the cover stories of magazines. They also decided to allow their game review scores to be updated as the games were updated, so as to more adequately reflect games that had changed with downloadable content and updates since their original release. The site received criticism for its comparatively low review score given to The Last of Us, which was later increased with the game's remastered edition. In consideration of games that may differ in quality before and after release, Polygon later began to mark pre-release reviews as "provisional" to defer final scoring until after their public release. Starting in September 2018, the site opted to drop scored reviews for games, as to let their reviewers have more freedom in how they review a game; they will substitute their scoring system for a "Polygon Recommends", a game that the reviewer, having played enough of the game to make a determination, can stand behind and support for the site. These Recommended titles subsequently will serve as the basis of selection of "Polygon Essentials", games that the site feels everyone should play. Polygon's emphasis on video production expanded in late 2013, and waned in mid-2014 with the loss of video staff and the editorial decision to run fewer feature articles. By 2015, the site began to shift from games-only coverage to pop culture coverage, similar to the scope of rival sites IGN and Kotaku. Polygon's Minimap podcast was named among iTunes's best of 2015, and New York praised the site's Car Boys web series. The website's flagship podcast, called The Polygon Show, launched in 2017 and discusses gaming and culture. It was named one of the "10 gaming podcasts every gaming nerd should know" by The Daily Dot in 2018. In May 2018, Polygon launched the YouTube series "Brand Slam", in which brand mascots battle against one another. The site uses a pink color palette and emulates the magazine-style layout of The Verge. The site was programmed to use HTML5 standards with a responsive design that adapts to the screen dimensions of laptops, tablets, and smartphones. This is partially to remove need for a separate mobile version. Their longform journalism was optimized for reading on tablets. The site uses a "direct content sponsorship" model of online advertising used by SB Nation and The Verge. For example, a video series sponsorship pairs brands with specific editorial content. Forbes wrote that Vox Media's avoidance of content farm and news aggregator tactics, and interest shown in building communities is desirable to "magazine-quality advertisers". The site pitched its longform journalism to advertisers as an indicator of high-quality content. The site's founding sponsors included Geico, Sony, and Unilever. As of June 2014, Polygon ranks fourth among games sites by Comscore web traffic data: behind IGN, GameSpot, and Kotaku. The same month, Grant reported that the previous month had been their most highly popular. ^ Vox's Bankoff was a former AOL executive and Joystiq was an AOL-owned video game blog. ^ Longform web journalism was uncommon at the time. ^ "polygon.com Traffic Statistics". Alexa Internet. Archived from the original on July 13, 2018. Retrieved September 1, 2018. ^ a b c d e f g h i j k Solomon, Brian (October 24, 2012). "The Inside Story Of Polygon, The Verge's New Gaming Sister-Site". Forbes. Archived from the original on August 3, 2014. Retrieved August 3, 2014. ^ a b c d e f g Duryee, Tricia (October 24, 2012). "Let the Games Begin: Vox Media Launches a New Site Covering Videogames". All Things Digital. Archived from the original on August 4, 2014. Retrieved August 3, 2014. ^ a b c d e f g h Stark, Chelsea (October 25, 2012). "Veteran Game Journalists Unite to Launch Vox's 'Polygon'". Mashable. Archived from the original on January 4, 2015. Retrieved August 3, 2014. ^ McElroy, Griffin (April 24, 2018). "It's a Departure". Polygon. Archived from the original on June 24, 2018. Retrieved June 25, 2018. ^ Cullen, Johnny (January 4, 2012). "Joystiq group, Crecente to form VOX Games – details". VG247. Archived from the original on August 4, 2014. Retrieved August 4, 2014. ^ a b Cullen, Johnny (April 6, 2012). "Vox Games becomes Polygon, Gera and Kollar become new staff members". VG247. Archived from the original on August 4, 2014. Retrieved August 4, 2014. ^ GamePolitics Staff (January 2, 2014). "Ben Kuchera Joins Polygon". GamePolitics.com. Archived from the original on August 4, 2014. Retrieved August 4, 2014. ^ Associated Press (August 13, 2015). "Digital Media Hub Vox Valued at $1B as NBCUniversal Invests". Inc. Archived from the original on August 10, 2018. Retrieved July 30, 2018. ^ a b Beaujon, Andrew (October 25, 2012). "Why Polygon takes video-games journalism seriously". Poynter Institute. Archived from the original on August 4, 2014. Retrieved August 4, 2014. ^ a b Johnson, Erik (October 16, 2013). "Polygon publisher Vox Media raises $40m". MCV. Archived from the original on August 4, 2014. Retrieved August 4, 2014. ^ a b c d Parfitt, Ben (June 19, 2014). "Three staff cut as Polygon moves away from features and video". MCV. Archived from the original on August 4, 2014. Retrieved August 4, 2014. ^ a b c Pearson, Dan (March 3, 2015). "Polygon hires The Mary Sue founder Susana Polo". GamesIndustry.biz. Archived from the original on September 5, 2015. Retrieved August 21, 2018. ^ Sinclair, Brendan (April 15, 2016). "SB Nation, Polygon launch League of Legends site". GamesIndustry.biz. Archived from the original on August 11, 2017. Retrieved June 7, 2017. ^ Grant, Christopher (June 7, 2017). "Introducing three new esports sites". Polygon. Archived from the original on July 16, 2017. Retrieved June 7, 2017. ^ Sinclair, Brendan (July 11, 2017). "Brian Crecente leaving Polygon". GamesIndustry.biz. Archived from the original on July 14, 2017. Retrieved July 14, 2017. ^ "The Verge's Chris Plante to take executive editor role at Polygon". GamesIndustry.biz. August 1, 2017. Archived from the original on August 15, 2017. Retrieved August 14, 2017. ^ Plunkett, Luke (August 10, 2017). "Polygon Parts Ways With Nick Robinson Following Twitter Claims". Kotaku. Archived from the original on December 1, 2017. Retrieved August 11, 2017. ^ McElroy, Griffin (April 24, 2018). "It's a Departure". Polygon. Retrieved April 15, 2019. ^ Tan, Nicholas (June 6, 2013). "Polygon Slammed For 7.5 Review For The Last of Us". GameRevolution. Archived from the original on August 4, 2014. Retrieved August 4, 2014. ^ Kollar, Philip (June 5, 2013). "The Last of Us Review: Dead Inside". Polygon. Archived from the original on August 4, 2014. Retrieved August 4, 2014. ^ Orland, Kyle (February 15, 2015). "The spotty death and eternal life of gaming review scores". Ars Technica. Archived from the original on April 10, 2015. Retrieved April 10, 2015. ^ Plante, Chris (September 4, 2018). "Polygon is updating its reviews program for 2018 — and saying farewell to scores". Polygon. Retrieved September 4, 2018. ^ Rogoff, Andrea (December 22, 2015). "Vox Media in the News: Week of December 21, 2015". Vox Media. Archived from the original on January 24, 2016. Retrieved January 24, 2016. ^ Feldman, Brian (October 14, 2016). "Car Boys, the Hilarious Existential Horror Car-Crash Series, Is the Best Fall Show". New York. Archived from the original on December 23, 2016. Retrieved December 10, 2016. ^ Cohen, David (October 3, 2017). "Vox Media Will Begin Livestreaming Circuit Breaker, The Polygon Show on Twitter". Adweek. Archived from the original on January 15, 2018. Retrieved August 21, 2018. ^ Knoop, Joseph (July 16, 2018). "10 gaming podcasts every gaming nerd should know". The Daily Dot. Archived from the original on July 18, 2018. Retrieved July 30, 2018. ^ Wohl, Jessica (May 9, 2018). "Marketers' Mascots Pummel Each Other to Submission in Polygon's 'Brand Slam'". Advertising Age. Archived from the original on June 13, 2018. Retrieved July 30, 2018. ^ a b Hillier, Brenna (October 25, 2012). "Vox Media's Polygon now live on dedicated website". VG247. Archived from the original on August 4, 2014. Retrieved August 4, 2014.